This members only club was founded in November 1916 as the Brighton & District Labour Club & Institute Limited and was known as such until March 1974. 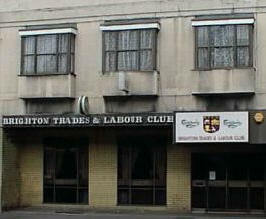 When the club name was amended to the one we know it by today, Brighton Trades Labour Club & Institute Limited. It has three bars and offices in Lewes Road. The main club premises were sited in London Road until 1963 when the building in Lewes Road, that began life as coaching stables, became the Arcadia cinema, then later a shoe makers was purchased. 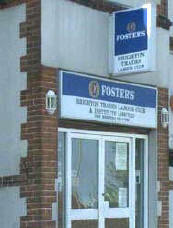 This was then enlarged by the acquisition of the shop next door and designed to be the entertainment centre of the club, which it still is today. There are two bars and the concert hall on the ground floor. The front bar has a large screen TV so sports fans don't miss the big occasion. On the upper floor is a bar. This can he hired for parties and special occasions. The bars are well stocked with a wide range of beers and spirits at competitive prices. Food is not available at present. The men's dart teams play on a Tuesday night, the mixed teams on a Wednesday night and the ladies on a Thursday night. The club premises in Lewes Road are a short bus ride away from the sea front, Brighton racecourse and Churchill Square shopping centre. Coaches can drop people here but there is no provision for parking. Children under 16 years of age are not permitted in the club after 9 pm on a Saturday or Sunday. To assist C I U club's planning a visit to Brighton, meals and entertainment can be provided to meet your requirements. However this must be booked at least four weeks prior to your visit. This was situated half way up Elm Grove and just a short walk from Brighton racecourse. It was more commonly known as the "Top Club". This eluded to the fact that Elm Grove being a hill the premises were higher than the Lewes Road premises or "Bottom Club". The bar was closed and sold in November 2012 for economic reasons. This closure brought to an end the exclusive position that we had among C I U clubs with having two premises. All enquires and correspondence should be sent to the secretary at the address below. Entrance to the club is restricted to members, associates and their bona-fide guests.